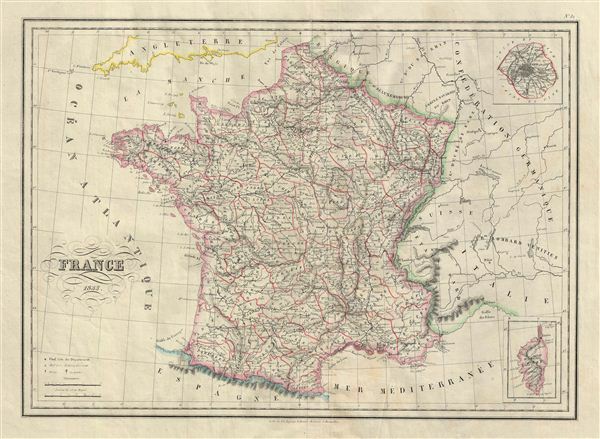 This is a fine example of Conrad Malte-Brun's 1833 map of France. The map covers France divided according to its constituent departments. An inset in the lower right quadrant details the island of Corsica while the inset on the upper right quadrant focuses on Paris. Various cities, towns, rivers, lakes and other topographical details are marked, with relief shown by hachures. Boundaries are outlined with color according to departments and territories. This map was issued as plate no. 32 in Conrad Malte-Brun's 1837 Atlas Complet du Precis de la Geographie Universelle. Very good. Original centerfold. Minor verso repair at centerfold. Blank on verso. Rumsey 0458.032 (1832 edition). Phillips (Atlases) 6079.